When contractors, home owners, miners or loggers think of heavy equipment the first name that always comes to mind is CAT, and this is no different with their line of skid steers. CAT Skid Steers are built for maximum power, operator comfort and efficiency. Monster Tires understands what you need to get out of your CAT skid steer to get jobs done on time and budget, and the easiest way to accomplish this is to use Monster tires for all your CAT Skid Steer Tires. We offer lower prices and faster shipping on all CAT Skid Steer Tires than any competitor, call us today with any questions or to get a quote. Everyone knows how important it is to get high quality tires for your Caterpillar Skid Steer. But it is also important to do it affordably. You can always get top of the line if you are willing to pay tons of money, but at Monster Tires we want to give you a good deal. We have top quality Construction Tread Tires for Caterpillar Skid Steer and Off the Road Tires for Caterpillar Skid Steer, along with competitive low prices to get your equipment rolling again. Quality is even more important than cost, though. With high quality skid steer times, you can ensure that your workers are safe, that your machine is not going to slip, and that you can get into difficult to maneuver spots to get your work done. Whether you are looking for Caterpillar 248 – 272 Skid Steer Tires or 216 – 246 Skid Steer Tires, we have the Caterpillar Skid Steer Tire Size Options to fit your needs. 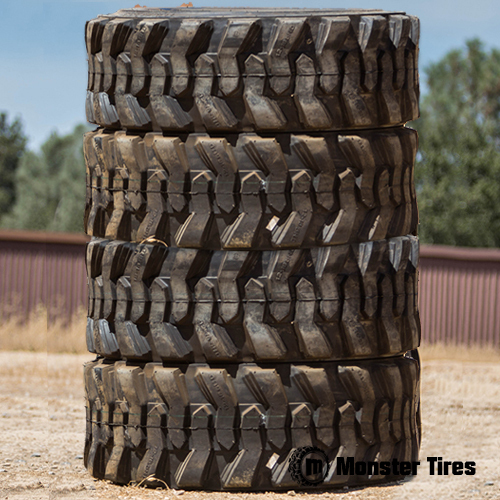 Trust in Monster Tires for your next set of Caterpillar Skid Steer tires!